In my Alien Contact series, humans from two different alternate Earths collide when a duplicate of Vancouver Island, the largest island off the west coast of the Americas, mysteriously appears off the coast of Washington State. It was propelled there by people from the future hoping to escape their planet’s environmental collapse. EARTH ONE is our world, a year or more in the future. ’Nuff said. EARTH TWO shared our world’s history until around 1800, so there are many similarities—but also many differences. For story purposes, the most important difference between the two Earths is that the Pacific Northwest is run by descendants of indigenous peoples, rather than Americans or Canadians as we know them. This meant that I had to project what a culture run by indigenous peoples, but influenced by technology, mass immigration, and a world economy might be like. All of this is background, not the meat of the stories, but I made a real effort to build a plausible aboriginal culture with technology more advanced than ours. I’d like to share some of my thought process with you. I wanted a chunk of land that could be easily (hah!) separated from North America. That ruled out the Navaho lands, which would’ve been my second choice. Before I started the series, I was fairly familiar with tribes of the Pacific Northwest, which helped. Totem poles from the region are widely known, so readers may have at least a passing acquaintance with the cultures. The Pacific Northwest was one of the last regions of North America to be colonized. By 1800, when the timelines split apart, native cultures were still intact, which can’t be said for all regions. This made extrapolation easier. France won the Battle of Waterloo on my alternate Earth, conquering England. Shortly thereafter, France conquered the US, too. What, you ask does the Battle of Waterloo have to do with native cultures on Vancouver Island? Lots! You see, the Pacific Northwest is quite remote from France, and before the Panama Canal it was almost impossibly remote. Without the westward push of immigration from the US, the natives had time to assimilate western technology before they were overrun by it. 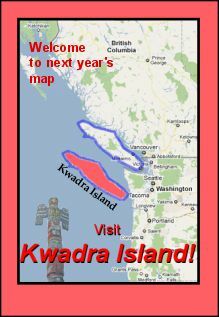 They also had time to form a nation state of their own, the Northwest Coast Kingdom, led by the Haida tribe. By the time European immigrants started flooding the northwest, a few decades later than on our Earth, the kingdom was strong enough to withstand the onslaught of whites. Very cool storyline, Ed. I look forward to seeing how it develops.